Imagine what would happen if ice cream and snow cones were combined, not in Jerry’s-style layers, but in one homogenous mixture. Or, maybe think about super smooth, almost creamy Italian ice. Sounds good, right? Such a thing exists, and it’s called water ice. You know how sometimes, there’s more flavor liquid than ice in snow cones, and they get kind of soggy and gross? Not so with water ice – my pink lemonade and coconut water ice stayed perfectly icy and creamy until the very end. 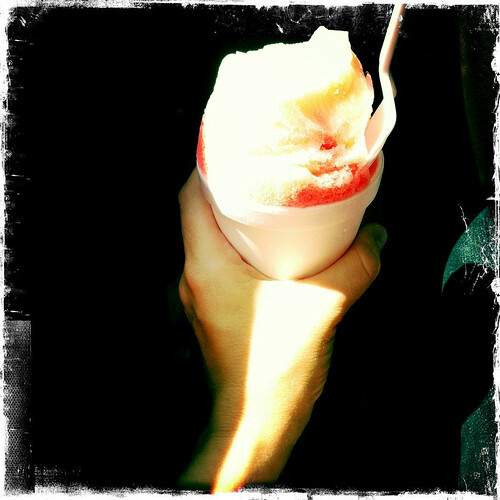 While it’s apparently super popular up north, there’s only one place to get it in Memphis – Parker’s Water Ice in Hickory Hill. The shop is small and there’s nowhere to sit, but there are about a dozen water ice flavors and plenty of soft serve ice cream options. 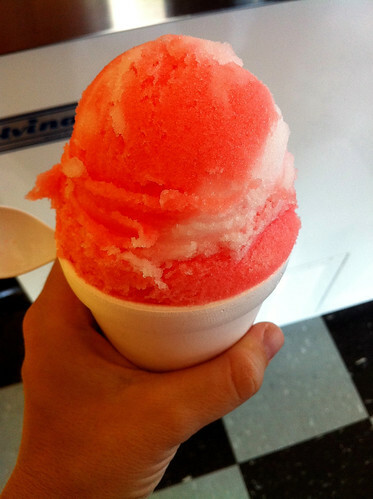 Plus, it’s inexpensive – a small water ice (which is plenty big) comes with two flavors and costs $2.75. Parker’s also has a bright orange food truck, so keep an eye out for it if you don’t feel like making the trek to Hickory Hill. This can be found at the zoo as well!!! You can get your Supreme blended at Jerry’s, you know. I’m sure it’s still not the same thing, but it’s an option if you don’t want the layers. My daughter and I visted Parker’s this past weekend. The ice was fabulous and I couldn’t believe how much ice we got for the money! I recommend this place to anyone. Love your blog! Can’t wait to try this. Have you done any reviews/top ten lists on good Memphis gas station food? Would be great to see some of your favorites! Made the trip to Parker’s this weekend. WOW. Really fine treat. Really nice folks. Worth the drive and the time – my kids give it a HUGE thumbs up. Every flavor was awesome except key lime, which had something of a weird aftertaste. Everything else (mango, watermelon, sour apple, cotton candy, orange cream, blue raspberry) A+++! I am obsessed with Parker’s Philly Water Ice. It is so good. Great thing it’s inexpensive!